It opens a popup which allows me to write my new alias. 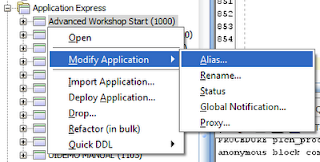 As with the other facilities of SQL Developer, you can opt to view the relevant SQL for this change. 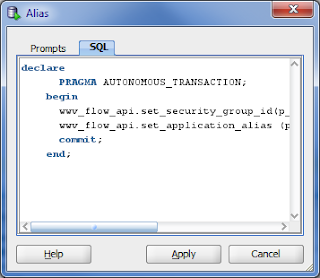 All Oracle is really doing here is calling the relevant API, but what I also noticed the first time I used it was the autonomous transaction pragma it applied to the anonymous block. 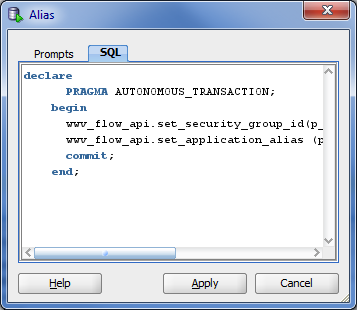 In the past I've quite happily applied this pragma for a procedure defined within a package, but this demonstrates we can also define independent transactions within these anonymous PL/SQL blocks, in addition to certain triggers. Something I added to the memory bank when I first stumbled on it.